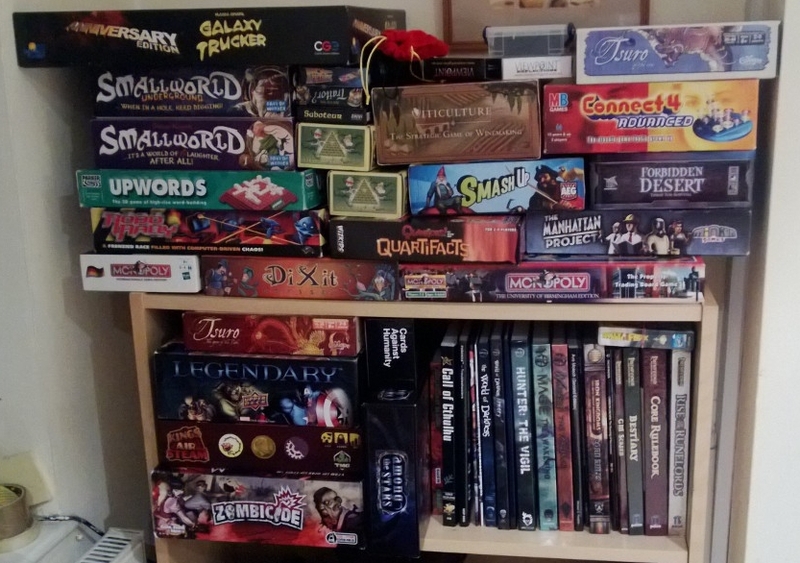 I’m going to start this blog off, with a picture of my board games collection. The reason for this is that I don’t really know what to post on a blog, and the only thing that comes to mind is to write something about myself. I’ve always played games, ever since I was small. Traditional Board Games when I was small, monopoly, scrabble, cluedo and the like, those games that everybody plays, but I never really enjoyed playing them (Well, maybe scrabble). My enjoyment of games came with video games, since my older brother got a PS1 I have always loved them, and since I got my first PC even more. Crash Bandicoot numbered among the earlier games I’ve played, and it still reflects today, where platform games are among my favourite genre’s, despite being sadly neglected in modern consoles. Since then memorable games for me in the earlier years of my gaming have been Quake 3, Jak & Daxter, Counter Strike, Ratchet and Clank, Battlefield 2142, Hydro Thunder, XGIII and Burnout (Wow, I never considered how many racing games I used to like). FPS games held my desires for a long time, but a few years ago got replaced by World of Warcraft. It’s funny, how I feel ashamed in many ways to say that WoW was a big part of my life, but it was something I needed, an escape from the world. I didn’t much enjoy my last few years of school, and timetables left me never seeing much of my friends at college, so I immersed myself in the game world. In the real world I went to college, ate, and come home, in WoW I was a user of the magic arts, I was something more. I don’t even think I care how pitiful that sounds, I needed it at that time in my life. Come University, I gave it up. It wasn’t that I got bored of the game, or didn’t want to play, it was that I was going to a completely new place, and I had a perfect opportunity to start afresh, to make new friends instead of feeling like a misfit. It was a great choice, and I instead occupied my time with friends, with the game of choice being Team Fortress 2, where we could run around in a manic scenario having fun together. That lasted a long while, until a friend convinced us to try out League of Legends, a game which I still love today. Our last year at University had LoL at the game of choice when meeting up with friends for games. I tended to organise LAN parties occasionally through all of University, as well as the Computer Science events, so it just a switch from TF2 to LoL at those times. We’re all fairly good at the game now, and playing 5-man teams in ranked games is amazing fun, even if we aren’t exactly top-level players (Besides, casually playing is more fun). Also in that final year of University I joined my friends in doing some roleplaying games. It’s such an amazing thing to just sit around a room with friends and immerse yourselves in something else, while still being highly social. The fact that noone overly serious about it and takes things in a casual light was just perfect. I stopped attending much around when I started playing board games, as I just didn’t find time, but I hope to attend one again, particularly now I have one of my mates that does it living in a house with me! Don’t worry, it’s on to board games now. Last year, Wil Wheatons tabletop series started airing on youtube. A friend showed me the first one, (Small World) and I kind of impulse bought it…and it’s sequel, and tried to convince everyone to play all the time. I had a lot of fun playing that, and wanted to try other games, so I went along to the UoB tabletop society with a couple of friends of mine to try other games. Since then I almost feel like doing so opened up a whole new chapter in my life, as I had enough fun that I booked off more Friday afternoons than not to attend the society and play board games with people. I even met Grace, now my wonderfully awesome girlfriend, at the society – I didn’t even notice I was attracted to her for a while, I just loved spending time with her and to be honest, probably stayed more to spend time with Grace than to play board games. I took to buying a lot more board games now that I came across more, via both Wil Wheatons series and the societies games. I discovered boardgamegeek and signed up in January, although I didn’t post for a while after that, to find out about more games. My collection has increased substantially from just Small World, so I now have some 40 games, and more on their way from kickstarter this year. I love playing them all, it gives me opportunities to be social where before I’d have sat in my room, and while I still love playing league of legends with friends, that has nothing on sitting to a table with them and enjoying a physical medium. So, below you have my collection of board games as it stands. Some of the RP books are mine but most of them are my housemate Kens. I’m so happy to have them, as they really are a bright spark in my life and have made me a much happier person in general, so I think they will be getting shown off frequently in this blog. This entry was posted in Me and tagged Board Games, Gaming, LAN, League of Legends, Life, Tabletop, Video Games, Wil Wheaton on September 10, 2013 by Smoothsmith.